Subnational political units are growing in influence in national and international affairs, drawing increasing scholarly attention to politics beyond national capitals. In this book, leading Russian and Western political scientists contribute to debates in comparative politics by examining Russia's subnational politics. Beginning with a chapter that reviews major debates in theory and method, this book continues to examine Russia's 83 regions, exploring a wide range of topics including the nature and stability of authoritarian regimes, federal politics, political parties, ethnic conflict, governance and inequality in a comparative perspective. Providing both qualitative and quantitative data from 20 years of original research, the book draws on elite interaction, public opinion and the role of institutions regionally in the post-Soviet years. The regions vary on a number of theoretically interesting dimensions while their federal membership provides control for other dimensions that are challenging for globally comparative studies. The authors demonstrate the utility of subnational analyses and show how regional research can help answer a variety of political questions, providing evidence from Russia that can be used by specialists on other large countries or world regions in cross-national scholarship. 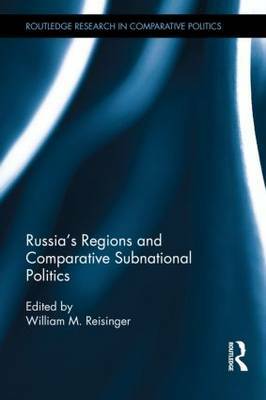 Situated within broader theoretical and methodological political science debates, this book will be of interest to students and scholars of Russian politics, comparative politics, regionalism and subnational politics.